Anti-theft luggage is boon to the travellers who can stay stress free of their luggage or things in it from being stolen. This market has a potential for new entrants and the existing players to grow. As per the tourists perception investigation they are being inclined to accept this technology but such anti-theft products are scarce. The technological advancement and its high demand have increased the competition globally. Goldstein Research analyst forecast the anti-theft luggage market size is set to reach USD 8.8 billion by 2024, at a CAGR of 17.4% over the forecast years. Superior design and technology acceptance by the travellers are important factor which will drive the growth of anti-theft luggage market. The report covers the present ground scenario and the future growth prospects of the anti-theft luggage market for 2016-2024 along with the import and exports of anti-theft luggage region wise. We calculated the market size and revenue share on the basis of revenue generated from major players and sales of anti-theft luggage from major players across the globe. On the basis of distribution channel, online stores holds the largest market share i.e. 53% in global anti-theft luggage market owing to the availability of more choices on online stores as compared to limited availability or non-availability in retail stores and also due to demand for cross country brands. Another segment of wheeled bags is growing at a fast pace owing to large number passengers across the globe due to increase in business travels and tourism. Anti-theft luggage Market Outlook 2016-2024, has been prepared based on an in-depth market analysis from industry experts. The report covers the competitive landscape and current position of major players in the anti-theft luggage market. The report also includes porter’s five force model, SWOT analysis, company profiling, business strategies of market players and their business models. Global anti-theft luggage market report also recognizes value chain analysis to understand the cost differentiation to provide competitive advantage to the existing and new entry players. According to the report, major driving factor for expansion of global anti-theft luggage market is the technological advancement, increasing disposable income of the people and growing tourism. The awareness of the availability of anti-theft luggage and its advantages over ordinary luggage being safe, stress free and smart travelling has resulted in the growth of anti-theft market. Further, the major challenge this industry is facing is its high cost due to technology inclusion and innovations. This factor is currently hampering the growth of anti-theft luggage market. Based on geography, North America dominates the anti-theft luggage market with almost 44.2% market share in 2016 because of high disposable income and higher percentage of travellers (business or personal), but still it is growing at a moderate pace in this region. Whereas, the Asia-Pacific region is fastest growing region at a CAGR of 17.9 %, where China and India are the major markets in this region, due to their high population, subsequently increasing disposable income and increasing tourism. 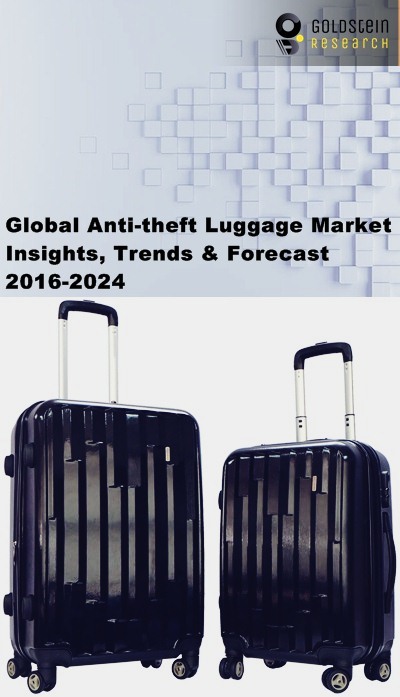 Our global anti-theft luggage market report comprises of the following companies as the key players in the anti-theft luggage market: Targus, Torg, Fabrique Ltd., Lenovo, Swissgear, Thule Group, AsusTeK Computer Inc., Case Logic. Other high-flying vendors in the anti-theft luggage market are: North Face, Incase Design Corp., Outpac Designs Ltd, Travelon Inc., Eagle Creek, Canada Luggage Depot, Kopack. What is the revenue of anti-theft luggage market in 2015-16 and what would be the expected demand over the forecasted period?